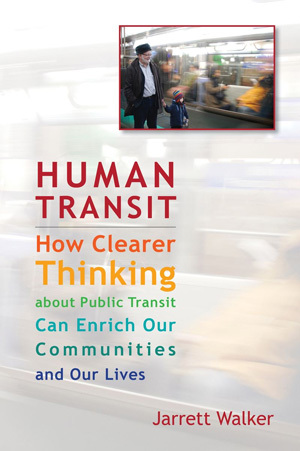 Human Transit The professional blog of public transit consultant Jarrett Walker. My thoughts on Ernest Callenbach's 1975 novel Ecotopia are up today at Atlantic Cities. Curious, isn’t it, how constantly we encounter the urge to bring village life into the city or, as Henry Ford attempted with his Village Industries, speed to reconstitute American farm life with the industry and mobility of urbanity. Where industrial capitalists, Shaker communitarians, Castro’s Cuba, and anarchist/libertarians theorists diverge in their social theory, they absurdly don’t depart in their spatial theory. At his last ever lecture of the Theory of City Form class at MIT a couple weeks ago (a class he inherited from Kevin Lynch), Julian Beinart remarked with bemused wonder at the seeming universal recurrence of this theme among utopias and planning theories. I don’t think it’s true that Americans were always so hostile towards Big City living. It’s not fair to say a group of people have some natural predisposition towards a certain way of life or thinking. The reality of the situation is that Big City means a lot of things to different people, and there’s a lot of cultural (and corporate – hello, General Motors) influences that can be analyzed. It may be poetic to say we have some predilection, but it’s also an injustice. @Brendan. I agree of course with your first statement. Lest I be misrepresented, let me clarify that I bat here for the neglected side. In this, indeed, I join a long list of American poets, artists, patriots and busybodies whose paeans of the Big City and their very lives need no defense. The challenge: to join them in the policy arena, where Ecotopian tastes tend to rudely interrupt the paths of ordinary urban lives, if not prevail over them. Since 1991 I've been a consulting transit planner, helping to design transit networks and policies for a huge range of communities. My goal here is to start conversations about how transit works, and how we can use it to create better cities and towns. Read more. © 2019 Human Transit. All Rights Reserved.